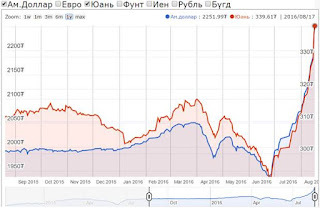 · The recent agreement reached between Mongolia, Russia and China on the transit corridor to Europe has created significant value in Northern Rail LLC and Aspire given the location of its rail and metallurgical coal assets. · Northern Rail's Erdenet to Ovoot Railway has recently been included in a new Northern Rail Economic Corridor connecting China and Russia through Mongolia as part of China's One Belt One Road Policy. All infrastructure projects on the agreed route will have priority funding status from Chinese banks. · Aspire will be advancing the path to construction of the Northern Rail corridor over the coming months with completion of the First Stage of the Rail Feasibility Study. Northern Rail is a key factor in the development of the Ovoot Coking Coal Project. · Following on from meetings with a number of potential funding parties and in parallel with the First Stage Rail Feasibility Study, Northern Railways LLC will now look to complete discussions on funding for the second stage of the feasibility study and EPC funding negotiations for the Erdenet to Ovoot Railway. · Aspire has negotiated a US$2m loan facility from a group of investors, including substantial shareholders, to commence rail pre-development activities for the Erdenet to Ovoot Railway. · This funding will enable Aspire's rail subsidiary, Northern Railways LLC, to complete both the First Stage of the Feasibility Study for the Erdenet to Ovoot Railway by end of December 2016 and environmental surveys by October 2016. · The newly elected Mongolian Government led by the Mongolian People's Party confirms that commencement of construction of the Erdenet to Ovoot Railway forms part of the new Government's agenda. August 18 -- Mongolian metallurgical coal explorer and infrastructure company, Aspire Mining Limited (ASX: AKM, the Company or Aspire), is pleased to announce that it has commenced the First Stage of the Rail Feasibility Study for the Erdenet to Ovoot Railway (First Stage Rail Feasibility Study). The Erdenet to Ovoot Railway forms part of the new Northern Rail Economic Corridor linking China with Russia through Mongolia. The First Stage Rail Feasibility Study is expected to be completed by December 2016. HONG KONG, CHINA--(Marketwired - Aug. 16, 2016) - SouthGobi Resources Ltd. (TSX:SGQ)(HKSE:1878) ("SouthGobi" or the "Company") announces the appointment of Mr. Joseph Belan as an independent non-executive director of the Company, with effect from August 16, 2016. Mr. Belan, aged 42, is the chairman and founder of Novatrek Capital, a corporate advisory and investment firm with the primary industry focus in the industrial and metals and mining sectors. Prior to establishing Novatrek Capital in 2013, Mr. Belan was an investment banker specializing in the industrial and metals and mining sectors with each of Merrill Lynch, Goldman Sachs and Credit Suisse First Boston. He was the Managing Director of Pala Investments Limited ("Pala"), a mining focused investment company and as part of his role with Pala, Mr. Belan was appointed as Interim Chief Executive Officer of Coalcorp Mining Inc. and directed its restructuring and asset divestment initiatives during 2009 and 2010. He has extensive experience in capital raising, restructuring, joint ventures and mergers and acquisitions for the mining sector. Mr. Belan obtained a degree in Honors Business Administration from the Richard Ivey School of Business at the University of Western Ontario in 1996. 5. to elect directors for the ensuing year. August 16 (AAStocks) WINSWAY (01733.HK) issued positive profit alert, expecting to record a consolidated profit for the six months ended 30 June 2016 as compared to the loss recorded over the same period in 2015. August 17 -- Wolf Petroleum Limited ("the Company or WOF") is pleased to announce the appointment to the WOF Board of Ms Xue Dongping as chairperson, Mr Johnson Xiang Qian Huang as a non-executive director and Mr Jack James as non-executive director. Ms Dongping brings a wealth of knowledge to the WOF Board through her extensive career in real estate development and corporate governance. Ms Dongping has acted as the General Manager and Vice President of Hengfeng Real Estate Development Co. Ltd and has been an Executive Director of Hunan HengfengWanjun Group Co. Ltd. Ms Dongping is currently the Chairperson of SAM Investment Group Co Ltd where she is responsible for the development of major decisions, industry development and strategic deployment. Mr Huang is an experienced CPA qualified accountant and director having a career spanning nearly 20 years within the financial services sector. Currently a Non-Executive Director of HB Ferny Pty Ltd, a wholly owned entity by Singapore Listing Company: Hobee Land, he offers advice in relation to property projects within the Australian market and provides the Group's accounting department with guidance in the regulatory space. Additionally, Mr Huang is director at Johnson & Co Aust Pty Ltd where he oversees accounting, taxation, SMSF accounting and SMSF audit and mortgage broking. Mr Huang brings strong corporate governance expertise to the WOF Board. Mr. James has over fifteen years of experience in chartered accounting specialising in corporate advisory and reconstruction. Mr. James is a partner of Palisade Business Consulting, which provides accounting, secretarial and advisory services to private and public companies, government and other stakeholders. Prior to establishing Palisade Business Consulting, he held senior roles in Ernst & Young and KordaMentha. Mr. James has a Bachelor of Business from the Queensland University of Technology and is a Chartered Accountant. The WOF Board also wishes to advise that Mr Brian McMaster and Mr Jargalsaikhan Dambadarjaa have resigned from their positions on the Board as non-executive directors, effective immediately, in order to focus on their other commitments. Mr Jonathan Hart has resigned as company secretary. Mr Hart is replaced in that role by Jack James and Kelly Snyman. Ms Snyman is a principal of Palisade Business Consulting. Ms Snyman has a Bachelor of Commerce from the University of Western Australia, is a Chartered Accountant and an associate member of the Governance Institute of Australia. Mr McMaster and Mr Hart are being retained as consultants until approximately October to assist the new board with corporate and associated transitional matters including the audit, upcoming general meeting and AGM. WOF welcomes the appointments of Ms Dongping, Mr Huang and Mr James and looks forward to the expertise they will bring to the Board in 2016. August 17 -- Draig Resources Limited (ASX:DRG) requests a trading halt to the trading of the company's securities until the earlier of an announcement in relation to a project acquisition and capital raising or Friday 19 August 2016. August 17 (gogo.mn) Former Leader of Democratic Party Z.Enkhbold noted at the press statement made last week "Financial sector crisis is not a brand new thing. We have talked many times about it". Indeed, rumour spread among the public that the new Prime minister is the most unlucky one. According to the statement by the Finance Minister, we have negative outlook for the economic situation and it is expected not to be saved within next four years. Previous authorities announced that the development of the underground mine at Oyu Tolgoi has officially began. The country is back to the business and approved 4.4 billion USD financing. Positive expectation created among the public that when it would boost the economy. However, Former Leader of Democratic Party Z.Enkhbold stated "Oyu Tolgoi is paying down Rio Tinto loans, not Mongolian loans in accordance with the agreement. We will receive USD 1 billion financing and it will be funded to the development of the underground mine". According to the Oyu Tolgoi Underground Mine Development and Financing Plan, the table below sets forth the indicative development and spending plan, including estimates of funds that will be spent within Mongolia to fund operating costs, Underground Stage construction and payments to the Government of Mongolia. The table is based on a number of assumptions relating to scope, costs, schedule, technical aspects and market conditions on which the projections contained in the UG FS are based. Estimated domestic Mongolian expenditures are based on historical Oyu Tolgoi experience and current development plans, however are subject to suitable quality, cost-effective, domestic suppliers. All amounts are estimates as of the current point in time and are not guaranteed; actual amounts will undoubtedly vary from these estimates. 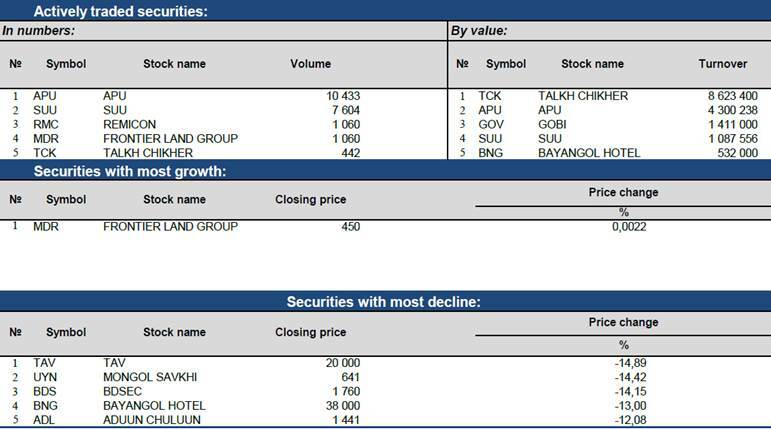 Oyu Tolgoi LLC announced its financial results for the quarter ended June 30, 2016, and released its latest Performance Scorecard. August 18 (MSE) On 16 August 2016, "Govi" JSC, listed on classification "I" of MSE, presented its half-year operating report to the public. "Govi" JSC is cooperating with international designers in order to produce internationally recognized Mongolian luxury brand products and aiming to be leading cashmere coat producer in the world. August 18 (MSE) On 16 August 2016, "Makh Impex" JSC, listed on classification "I" of MSE, presented its half-year operating report to the public. From 2015, "Makh Impex" JSC had started the technological innovation on its meet processing equipments. In 2016, the company fully renewed its sausage and canned food equipments. Also, it introduced Euro standart packaging technology, which was first in Mongolia even in Asia. Now, the company is working on to introduce ISO22000 quility managing system in order to increase its export production. "Makh Impex" JSC awarded Gold and Silver medal on brand name "Nuudel" and "Deejis" from IFFA International Meat Processing Sector Exibit in 2016. It was first Mongolian company that awarded medal from this exibit. 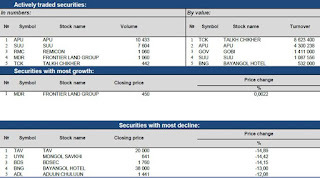 August 16 (Bloomberg) -- Inbound foreign direct investment was withdrawal of $4.5b in Q2 as revised data takes into account payment made by Oyu Tolgoi LLC to Rio Tinto Group, said Batsuren Bazar, director of the Statistics Division of the Bank of Mongolia. August 17 (UB Post) The National Registration and Statistical Office (NRSO) presented socio-economic data for the first seven months of 2016, and announced that the nation's budget deficit has reached 1.97 trillion MNT, up by 1.3 trillion MNT in comparison to 2015. The NRSO believes that the budget deficit growth is linked to state budget expenditure and loan repayment exceeding the nation's income. In May, the NRSO reported that the nation's balanced budget income stood at 2.85 trillion MNT, while loan repayment and expenditure was 2.96 trillion MNT, resulting in an 877 billion MNT deficit. However, two months later, the NRSO reported that the state's budget expenditure and loan repayments surged to 5.14 trillion MNT. The NRSO also reported that the average monthly income of Mongolians was 874,400 MNT, a figure down by 101,300 MNT (10.4 percent) over the same period in 2015. As of the end of July, money supply equaled 11.3 trillion MNT, up by 120.1 billion MNT compared to the previous month. The NRSO believes that the money supply increase was influenced by 289.8 billion MNT in the growth of savings at commercial banks. August 16 (Bank of Mongolia) Spot trade: Commercial banks bid for USD and CNY. The BOM sold USD26.0 million at the closing rate of MNT2243.81 and CNY93.2 million at the rate of MNT332.35-339.50. Swap and forward trade: Commercial banks bid for USD17.0 million of MNT swap agreement and asked for USD1.4 million of USD swap agreement. The BOM accepted the offers. 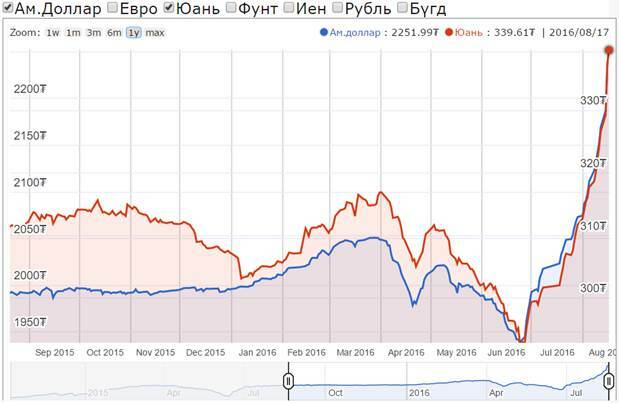 August 16 (Bloomberg) Mongolia's tugrik, the world's worst-performing currency in August, is in its longest losing streak on record as the nation's government seeks ways to stabilize an economy it says is in the grip of a crisis. The currency weakened a 22nd day to 2,243.50 per dollar as of 5:05 p.m. in the capital Ulaanbaatar, the lowest level in Bloomberg data going back to 1993. The tugrik's 7.8 percent drop this month is the biggest among 154 currencies tracked by Bloomberg, taking its decline in 2016 to more than 11 percent. Mongolia has suffered from falling commodities prices, an economic slowdown in China and waning interest by foreigners spooked by anti-investment laws and inconsistent policy. Prime Minister Erdenebat Jargaltulga has rolled out an economic recovery plan that includes salary cuts, debt reduction and development of a council to attract foreign investment, according to a televised statement issued Tuesday. He became prime minister after the Mongolian People's Party unseated the Democratic Party in a landslide win in June elections. Mongolia had foreign currency reserves of $1.3 billion at the end of June, according to data published by the central bank. That cash pile declined 23.1 percent from a year earlier after the previous government increased spending ahead of the elections. A team of International Monetary Fund representatives arrived in Mongolia Tuesday and will begin talks with the government on resolving economic challenges, according to local television. Neil Saker, the IMF's resident representative in Mongolia, declined to give details of the meetings, saying it's the "IMF's routine global practice to establish early contact with newly elected governments." August 16 (Bloomberg) Mongolia's prime minister is considering new measures to tackle an economic crisis with slowing growth, a declining currency and a soaring budget deficit. Bloomberg's Duuya Baatar reports on "Trending Business." August 18 (Bloomberg) On today's "Deep Dive," Bloomberg's Scarlet Fu, Joe Weisenthal and Matt Miller take a look at Mongolia's tugrik, emerging markets and Target same-store sales. They speak on "What'd You Miss?" August 16 (Bloomberg) -- Mongolian Prime Minister Erdenebat Jargaltulga has rolled out an economic recovery plan that includes salary cuts, debt reduction and development of a council to attract foreign investment, according to a televised statement. * Minister of Finance Choijilsuren Battogtokh joined PM in issuing statement. * Program will target development of agricultural sector to produce export-ready products, will promote the production of construction materials and will promote processing and adding value to mineral products. August 17 (UB Post) Prime Minister J.Erdenebat and Minister of Finance B.Choijilsuren made a public statement regarding the nation's economy, and reported that the Cabinet has decided to lower the salaries of select state servants and cut other expenses to benefit the nation's economy. Beginning the public address, Prime Minister J.Erdenebat presented information about the economic conditions of Mongolia and government measures to be taken to improve the nation's economic situation. He underlined that after the Finance Minister's speech last week about the nation's economic, budgetary, and financial conditions many disputes arose, and that he had decided to present accurate information to the public, media, and the domestic and foreign markets. J.Erdenebat underlined, "Presenting accurate information creates the possibility to plan and work in the future. By giving inaccurate statistics and information about the economy, or by presenting fixed information, we won't be able to correct them later. We will appropriately define the nation's economic analysis and take measures in the future." "Everyone knows that economic conditions are difficult now. We know that we shouldn't lie and cheat ourselves. We can never cheat foreign investors. We draw resources by presenting accurate information. Fixing any quantitative data causes great damage to the economy. That's why we thought of presenting accurate information at first. We will start the economic recovery based on this data," he said. "Unfortunately, many new, unregistered measures, concessional agreements, and projects are coming out at the Finance Ministry every day. We shouldn't be deviating from the global standard that a nation should have only one budget. We needed a lot of time to integrate all the budgets." The Cabinet reported that it is planning to take measures for recovery in two stages. In the first stage, the Cabinet plans to work toward stabilizing the nation's macroeconomy and fixing the budget. The second stage will focus on implementing policies to support the economy. The PM noted, "One of biggest mistakes of Mongolia is that we just talk without making any progress. As of today, there are five to six energy projects around Ulaanbaatar. Implementing only one of them would produce enough energy to meet Ulaanbaatar's power consumption. Our Cabinet will tighten many redundant projects and implement only the ones that will meet the nation's needs in every sector, focusing on one to two projects." PM J.Erdenebat submitted a request to the Speaker of Parliament to discuss and make amendments to the state budget. He believes that amending the budget will create possibilities to stabilize the macroeconomy and correct issues concerning the state budget. The Cabinet is working to submit a program to overcome the economic crisis to Parliament. "Mongolia doesn't have any development projects with a completed feasibility study. For instance, even though the country has defined its railway policy, we don't have any railroad construction projects underway. The Cabinet will focus on finding the financial resources and completing feasibility studies for them," the PM stressed. The PM also said that the Cabinet has decided to lower the salaries of state servants and focus on policy to protect jobs. "The Cabinet will try to retain as many jobs as we can. When people lose jobs during an economic crisis, the economic burden is greater. We will mitigate salaries in some sectors, but we will adhere to a policy to not decrease the salaries of state servants with lower income," said J.Erdenebat. Following the PM's statement on cutting salaries for state servants, the public started voicing their objections on social media. Yesterday, Chairman of the Finance Ministry's Budget Policy Department J.Ganbat provided clarification of the PM's report. He said that the salaries of high ranking state officials, including the President, Prime Minister, and MPs, will be lowered by 30 percent. The salaries of public administration officials will be decreased by 20 percent. The Cabinet believes that the salary cuts will save around three billion MNT in 2016 and eight billion MNT in 2017. The Cabinet also reported that it will lower all other expenses for state servants, including transportation and other luxuries. August 17 (UB Post) Chairman of the Democratic Party (DP) group in the parliament, MP S.Erdene, and MP Z.Narantuya held a press conference yesterday at the State Palace to tell the Mongolian public that Cabinet's decision to suspend the "Good" programs initiated by the DP over the past four years is a policy mistake. DP members say that the Good Student, Good Fences, Good Herder, and Good Shares programs were implemented with financing from commercial banks through a 553.8 billion MNT loan issued by Mongol Bank. S.Erdene explained that commercial banks have taken on the financial risk of issuing the loans to the program participants. DP authorities stressed that the decision to terminate the "Good" programs, which the DP says were implemented on business principles, is wrong and a violation of the Law on Budget. The MPs blamed years of poor economic structure for the economic slowdown, and underlined that the DP began their work in government by correcting the errors made by previous governments. MP S.Erdene also stated that Prime Minister J.Erdenebat's statement about reducing the salaries of some state servants is a violation of the law. He said that the Prime Minister's decision is a serious violation of the Law on State Service, which states, "Any action to cut expenses for state services will not be grounds to eliminate state payments for state servants, or to reduce their salary, compensation, welfare or pension." DP authorities have also complained that the MPP's decision to cut wages contradicts the MPP's plans to increase the average household income by supporting employment and increasing salaries, pensions, and welfare allowances in phases. "Today, over 180,000 servants are working for the state, earning a living for their families and children. The Prime Minister should first cut down on expenses, like the expenses of deputy ministers, large SUVs, and maintenance in the Prime Minister's office, rather than reducing the salaries of state servants," stressed MP S.Erdene. Ulaanbaatar, August 17 (MONTSAME) The Mongolian People's Party (MPP), the largest and the oldest political party of Mongolia, concluded recent parliamentary elections held on June 29 with the strong victory by winning 65 seats out of 76 seats. Since 1992, when Mongolia ratified its new Constitution since democratic changes in the country, MPP has garnered victories in most of parliamentary elections except those in 1996 and 2012. The top five runners who got the highest votes in their respective constituencies are Delgersaikhan Borkhuu (68.9%), Davaasuren Tserenpil (63.7%), Tserenbat Namsrai (58.2%), Enkhbold Miyegombo (58.2%) and Oyun-Erdene Luvsannamsrai (52.8%), among whom Oyun-Erdene, Alumni of John Kennedy School (Harvard University), is one of the youngest Members of Parliament of Mongolia. At the present moment, the Parliament is deliberating the nominations for new Cabinet members which are accompanied with high expectations and strong demands from the general public to create "professional" Cabinet which would be competent to restore worsening socio-economic situation in the country. August 17 (news.mn) As we have reported, B.Bulgan the wife of S.Zorig, the "Golden Swallow of Democracy", has been in prison awaiting trial since November in 2015. She has been held incommunicado at a detention center in Tuv Province. According to Deputy State General Prosecutor E.Amarbat, B.Bulgan and two others have been accused of the murder of S.Zorig. This is top secret case. Another source said, intelligence officers have begun questioning B.Bulgan. S.Zorig was murdered on Friday, October 2, 1998. It was as shocking to Mongolians as President Kennedy's assassination was to Americans. In 1990 S.Zorig led huge pro-democracy rallies which ended 70 years of communist rule in the landlocked country of steppes, taiga and desert between China and Russia. Once he defused a potential Tiananmen Square-type bloodbath by persuading 10,000 pro-democracy protesters to sit down rather than confront armed soldiers. August 16 (UB Post) Mongolia launched the new postal and address system What3Words on August 12. What3Words aims to be "the simplest way to communicate location". Its addresses pinpoint locations in a series of 3×3 meter squares with random but fixed three-word names, such as snacking.ooze.thigh for a residential address just south of Jamyan Street. Reportedly, residents can now have their mail sent to their What3Words address through Mongol Post. Last Thursday, Ulaanbaatar Mayor S.Batbold was introduced to the new postal and address system by Chris Sheldrick, co-founder of the British startup What3Words. The Mayor was said to be fascinated by the new technology and pleased to introduce a Mongolian version of the global addressing system. Sheldrick highlighted that Mongolian was the 11th language to be introduced to the system, and said that What3Words would make memorizing and communicating addresses much easier. The What3Words application can be downloaded to smartphones for free. The system first launched in 2013, with backers including Intel Capital. The company won the Grand Prix for Innovation at the 2015 Cannes Lions International Festival of Creativity. (FreightNet) The enquirer requires a shipping rate for Frozen lamb and beef to be despatched by Multimodal and arrive no later than 30/09/2016. The consignment is departing from Mongolia and arriving at Vietnam. Full details of this shipping rate request can be found below. Only Premium members with an office in Mongolia or Vietnam can respond to this rate request. August 17 (news.mn) The transportation trial has already begun of the transit route from the Chinese Port of Tianjin, via Ulaanbaatar to the Russian city of Ulan-Ude. An echelon of trucks are running through China today (17th August). In total, 26 delegates from China, 15 from Russia as well as more than 10 from Mongolia gathered in the port of Tianjin to launch the trial. According to the transit transportation programme, the convoy of trucks will pass through the Mongolian border crossing of Zamiin-Uud on 20th August. It now takes only 8 minutes to check a batch of goods at the border Mongolian crossing. As the trucks make their progress, the new venture is being celebrated - in UB a ceremony will be held outside the 'Dunjingarav' shopping mall on 21th of August 11:30 am. August 16 (gogo.mn) We interviewed with Mr. Rocco Suckert, founder of German Prime Doner and Pasta Girl fast food restaurants. -Why did you decide to open German Prime Döner in Mongolia? -When I first came to Mongolia in 2010 during my vacation, I traveled around the countryside and met with many friendly people. Then I really wanted to live here and we moved to UB in 2013. I have found that UB has no places serving döner tastes like German. Therefore, I have decided to start my fast food restaurant and founded our company in Mongolia. -Yes. I am professional chef of German, Italian and French cuisine. I had worked as a chef at the biggest German restaurants for about 20 years. Also, I had worked in Mongolian restaurants as a chef. Currently, I work as a restaurant consultant in other restaurants. -Why did you decide to open fast food restaurant? Why not restaurant? -Originally, we have not interested in restaurant business. Because people are busy now. They have no time to wait food at fancy restaurants. Thus, we opened German Prime Döner fast food restaurant for those who need healthy and affordable food with quick service. Our first branch was opened at SW from State Department Store on Sep, 2013. But it is closed now. Currently, we are operating with two branches. 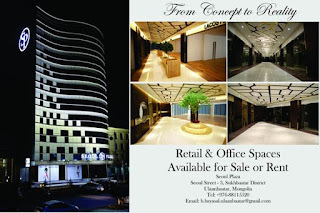 One is located in Gegeenten Entertainment center`s 2nd floor and the other one is located in Emart`s first floor. -What is the specific working method of cook? -A cook must be able to organize and plan not only cooking food but also everything needed in the kitchen. I try to put my heart and soul into my work and I want youths to work right from the beginning. I think, people learn new lessons from life everyday and busy people complete more tasks. Of course, I am a German and I am punctual. Also, I aim to do what I say and do any work comply with the standards. -Why you named "German Prime Döner"? ​-Döner is originated from Turkey. They introduced döner in Germany with different taste and ingredients from their local and we follow that technology. Moreover, we offer other German cuisines to our customers. That is why we named it "German Prime Döner". -What is the German Döner, what kind of food is it? -German-style döners are seasoned meat processed into a large cylindrical loaf, roasted on a vertical spit, then thinly sliced with a long knife and wrapped in flat bread with vegetable toppings and, sometimes, a spicy sauce. In Germany, meat used in döner is prepared in production methods. However, we process the meat everyday by ourselves, (hand made) using Mongolian beef and chicken. Also, we buy the flavors from Germany and we use fresh and healthy recipes. We order breads from Turkish bakery. -How do you find running business in Mongolia? -Even döner is a fast food, we aim to deliver healthy and fresh food to our customers. Mongolian beef comes with variety of quality depending on local areas. Some are tough and some are tender. In Germany, döner meat is cut off directly from the grill. However, we fry it again here due to its raw inside. As a result, our döner meat become too dry and seems burned. Moreover, it is hard to find ingredients here. We buy flavors from Germany. Also, we are facing lack of professional cook and human resource. Therefore, we train our employees. Also, I wanted my customers to be honest and fair. I feel that people like to criticize each other when I see the posts of social media. If you face problem at somewhere you visit, you should talk to their manager first. But people prefer to write the problems on Facebook groups which can be ruined someone`s lifetime effort. They do not think of people behind the restaurants or places they visit. -What are you focusing on now? -We have just opened our New franchise "Pasta Girl" at Emart new shopping center's first floor to introduce actual Italian pasta's taste to Ulaanbaatar city with reasonable price and new way of serving and cooking which customers can see and witness the way their pasta would be cooked in front of them. We are serving not just Italian pasta, we are serving Pizza cooked in stone oven, Italian delicacies such us Trimasu, Panna Kotta and etc. We are proudly serving Italian taste with polite and courteous services while reaching our each customer's heart. -How many employees do you have now? -Currently we have 35 employees with 2 shifts. We work hard on to ease employee's working conditions by obtaining best equipment. Because we have 2 shifts system, students can work for us. I am so proud to say that our team have tendency to learn new knowledge, are always on time, have great greeting skills and perform work with their heart. -We are planning to open another of our branches in Center of Ulaanbaatar city and introduce new approach in Restaurant sector in Mongolia. Hopefully I will fulfill my plans soon. -What is your advice for youths? -It depends on person itself to be successful. So you always have to continue to learn, always love what you do, do your work from your heart, utilize your time efficiently and right. So I want to suggest that young people today always have to remember that you are the future of Mongolia, instead of wanting to do bigger, grand things, please do simple things, starting from yourself by becoming right or correct person and leave your life correct way by that you will contribute that much to future of Mongolia. -Thank you for your time. Good luck. August 16 (gogo.mn) In 2013, City Council meeting introduced a draft resolution to rename Sukhbaatar Square after Chinggis Khaan. At that time, Z.Khaidar, great-great-grandson of Commander D.Sukhbaatar, contested the decision to rename Sukhbaatar Square after Chinggis Khaan and applied for a court to change it back. Today Administrative Court made the decision to retain the name as Sukhbaatar square. Z.Khaidar, great-great-grandson of Commander D.Sukhbaatar, posted on his Facebook "Administrative Court finalized the name of the main square of UB today. From now on, the square will be named after Sukhbaatar, hero of the Mongolian People`s Revolution. I would like to express my gratitude to all lawyers worked on that case". August 17 (gogo.mn) As the new school year approaches the cars will be limited by odd and even numbers starting this weekend. On Aug 21 and Aug 28, license plates ending with even numbers (0, 2, 4, 6, 8) will be limited to take part in traffic. The above limitation will be effective from 8AM to 8PM on those days in order to reduce the traffic as was reported by the Traffic Police of Ulaanbaatar city. August 16 (gogo.mn) "City without weed" campaign to prevent residents from allergies caused by weeds is ongoing. The campaign covers all districts. Bayanzurkh district have removed weeds and cultivated plants can trigger allergic reactions jointly with Public Service Department I, II, III, IV. Specifically, weeds at Dund gol, Officer`s Palace and Peace Bridge have removed. August 17 (UB Post) Prime Minister J.Erdenebat met with Great Britain's Ambassador to Mongolia Catherine Arnold yesterday, and discussed economic cooperation and educational opportunities for Mongolian students. Recalling that Mongolia established diplomatic relations with Great Britain, the first among its relations with Western countries, in 1963, Premier J.Erdenebat noted that Mongolia attaches great significance to its ties with the United Kingdom. Expressing gratitude for British companies having an interest in cooperating with Mongolia in the mining and energy sectors, J.Erdenebat promised that the Government of Mongolia will pay more attention to creating an environment that will attract foreign trade and investment. The Prime Minister also thanked Great Britain for allowing 16 Mongolian students to study with Chevening Scholarships provided by the Government of the United Kingdom and asked Ambassador Arnold to study the possibility of increasing the quota for scholarships given to Mongolian students. He also expressed his interest in cooperating with the "Great" campaign of the UK's Premier, promoting Mongolia abroad. Emphasizing the significance of reciprocal high-level visits in strengthening bilateral relations, J.Erdenebat reminded Ambassador Arnold of Mongolia's invitation to Britain's Prince Harry to visit Mongolia. August 17 (UB Post) Prime Minister J.Erdenenbat received Ambassador Extraordinary and Plenipotentiary from the Republic of Turkey to Mongolia Murat Karagoz on August 11, as part of a series of meetings with foreign ambassadors to Mongolia held after taking his office. Highlighting that the historic relationship between Mongolia and Turkey dates back to ancient times, the Prime Minister spoke about the productive development of bilateral relations and comprehensive strategic partnership in various fields. He confirmed that the Government of Mongolia will focus on increasing the frequency of high-level meetings by expanding bilateral economic cooperation, and added that he will pay attention to hosting the regular conference of the Mongolia-Turkey intergovernmental committee on trade and economy in Ulaanbaatar in the near future. Currently, over 900 Mongolian students are studying in Turkey, and nearly 300 of them have received scholarships from the Turkish government. The Premier thanked the Government of Turkey for supporting Mongolian youth in obtaining higher education. During the meeting, Ambassador Karagoz noted that the Turkish International Cooperation and Development Agency has financed over 450 projects and programs in Mongolia with nearly 30 million USD grant aid as part of intergovernmental negotiations. Ulaanbaatar, August 17 (MONTSAME) Belarus is a highly-developed country in industries, so the country has willingness to make the cooperation closer with Mongolia in the fields of road, transportation, mining, education and science. It was said by Mr S.V.Chepurnoi, the Ambassador Extraordinary and Plenipotentiary of Belarus to Mongolia when he has been received by the Prime Minister J.Erdenebat. The Premier mentioned about opportunities to establish an operator company in Mongolia to assemble Belarusian techniques and technologies and to supply public-transport buses to Mongolia. J.Erdenebat said that the two countries are possible to boosting their relations and cooperation in economic and commercial spheres, J.Erdenebat talked with the Ambassador concerning. Then the parties agreed to continue discussing these issues. August 17 (UB Post) Prime Minister J.Erdenebat met with Ambassador of Canada to Mongolia Ed Jager on August 11, to share views on bilateral relations and cooperation, and to discuss the upcoming official visit of Speaker of the House of Commons of Canada Geoffrey Regan in September. Even though Canada is far from Mongolia in terms of the geography, Canada holds a special place in Mongolia's foreign policy, underlined the Prime Minister. He assured the Ambassador that Mongolia is willing to expand and develop bilateral relations and cooperation in all sectors. Confirming that Mongolia is an important partner in Northeast Asia for Canada, Ambassador Jager highlighted the active development of bilateral relations and cooperation. He recalled that in addition to Canada issuing 20 percent of the 4.1 billion USD required for the development of the Oyu Tolgoi underground mine, it is also carrying out various programs and projects in trade, economic, and development collaboration to strengthen democracy in Mongolia. The sides also noted the significance of maintaining the frequency of reciprocal high-level visits in developing bilateral relations and cooperation. During the meeting, Ambassador Jager informed the Premier that Speaker of the House of Commons of Canada Geoffrey Regan will conduct an official visit to Mongolia in September. The visit is expected to help finalize documents that will form legal grounds for bilateral trade and economic relations, including an agreement on promoting and protecting bilateral investment. August 17 (UB Post) Prime Minister of Mongolia J.Erdenebat received the Ambassador Extraordinary and Plenipotentiary from Kuwait to Mongolia, H.E. Khaled Al-Fadhli, yesterday upon the Ambassador's request, to discuss investment in sectors such as healthcare and bilateral relations. Beginning the meeting, Ambassador Al-Fadhli conveyed greetings from Kuwait's Prime Minister and congratulated J.Erdenebat on his appointment to Head of the Cabinet. Emphasizing his satisfaction with current bilateral relations and cooperation, the Ambassador expressed Kuwait's interest in increasing investment in Mongolia. He underlined the significant role of Kuwait's development fund in Mongolia's development in sectors that have received investment. In 2006, Kuwait issued grant aid of 12 million USD to Mongolia to build a new parliamentary house with financing from the Kuwait Fund for Arab Economic Development. J.Erdenebat proposed issuing grant aid to the health sector, in particular, for the construction of a new burn center in Mongolia. The Ambassador confirmed that Kuwait is willing to provide support in renovating and expanding the airport in Undurkhaan, Khentii Province. The sides reached a decision to intensify efforts to develop feasibility studies to be submitted to Kuwait's government through the Kuwait Fund. Ulaanbaatar, August 17 (MONTSAME) Ambassador Extraordinary and Plenipotentiary of the People's Republic of China Xin Haiming is working in Uvs aimag. In scope of the visit, the Chinese delegation comprised 16 officials have been received by authorities of the aimag, holding a meeting to discuss issues of cooperating in agriculture, trade and socio-economic sectors. As results of the visit, Uvs aimag has created opportunities for exporting to China raw meat, sea-buckthorn, its products and to collaborate with China in infrastructure and health sectors. Within the tour, the China's delegates will head for Zavkhan aimag. Ulaanbaatar, August 16 (MONTSAME) The Eighth Mongolia-China Press and Media Conference is to take place in Chingis city of Khentii province on August 19-21, informed Friday the officials from the Confederation of Mongolian Journalists on a press conference. Present at the press conference were, the President of the Confederation of Mongolian Journalists B.Galaarid and the Deputy Director S.Altantsetseg, and the officials from the government of the Inner Mongolia Autonomous Region of China and the Mongolian Embassy in China. The Medium-and Long-Term Program on Implementation of the Mongolia-China strategic partnership, took effect in 2013, obligates that the sides should exchange annual press forums, visits, news data and alleviations for mutual reporting. The previous annual forum was hosted by Alxa province of the Inner Mongolia Region. Mongolia is being represented with a delegation led by D.Tsogtbaatar MP, officials from PR Division of the President's Office, Department head at the Ministry of Foreign Affairs Kh.Mandakhtsetseg, the deputy G.Baigalimaa, President of the Confederation of Mongolian Journalists B.Galaarid, and including NGO leaders, administrators of Khentii Province, delegates from MONTSAME Agency, the Mongolian National Broadcaster, National News Newspaper and News.mn website. China is represented in this forum by some government officials in connection with media, representatives from Xinhua Agency, People's Daily Newspaper, People's Central Radio, CCTV, Inner Mongolian Radio and Broadcaster and the Institute of Mongolian Studies of Inner Mongolia. Ulaanbaatar, August 16 (MONTSAME) Deputy Prime Minister U.Khurelsukh welcomed at his office the Ambassador of the Russian Federation to Mongolia I.K.Azizov on August 16. The latter congratulated Mr Khurelsukh on being appointed the Deputy PM and conveyed the greetings to him from the Russian Deputy Premier. The sides exchanged opinions on security and free-zone related cooperation. In specific, the dignitaries considered promoting development of Altanbulag Free Zone, providing the Russian companies with more favorable business environment there, and alleviation of border and custom procedures. They unanimously agreed that it is necessary for the sides to boost collaboration in emergency, in connection with the increased frequency of natural calamities and number of deaths. Deputy PM U.Khurelsukh underlined that his efforts are being put to realize the frameworks reflected in the Medium-term Program on Implementing the Strategic Partnership. For instance, the emergency council is prioritizing the intended establishment on early identification of epidemic outbreaks near the borders, early prevention, immediate exchange of information and conduction of quarantines. August 17 (gogo.mn) "Hope, faith, possibility - Ulaanbaatar 2016" marathon, initiated by the Achilles International of Mongolia, will be held on Sep 10 at National Amusement Park. The marathon is open to everyone and it aims to create opportunities for disabled people to pursue sports and increase their confidence with sports. Registration fee depends on the running distance and the it will be funded to the development of disabled people. August 17 (gogo.mn) On Monday 15 August 2016, Health Minister Tsogtsetseg Ayush and Australian Ambassador John Langtry hosted reception for Australian and Mongolian doctors who treat children with burns. An Australian specialist medical team from Interplast is visiting Mongolia in August to perform surgery on Mongolian children who suffer from burns. Mongolian doctors at the National Trauma and Orthopaedic Research Hospital and Khuvsgul United Hospital will work with the team and learn the latest methods in plastic and reconstructive surgery, anaesthetics and burns treatment. The Interplast team consists of Dr Kirstie MacGill, surgeon; Dr David Pescod, anaesthetist; Ms Lynne Sullivan and Ms Angela Doherty, nurses; and Ms Diana Francis, hand therapist. They will visit the Khuvsgul United Hospital in Murun from Wednesday 17 to Saturday 20 August 2016 and the Burns Department of the National Trauma and Orthopaedic Outreach Centre in Ulaanbaatar from Monday 22 to Thursday 25 August 2016. Interplast first commenced programs in Mongolia in 2008 in cooperation with the Mongolian Ministry of Health. lastic and reconstructive surgery, burns management and treatment program in which Interplast will work closely with Mongolian surgeons, anaesthetists, nurses and allied health workers to improve access to plastic and reconstructive surgery and appropriate management of burn injuries for Mongolian patients. This program is generously funded by the Australian Bright Blue Foundation – Police Commissioner's Fund for Sick Kids and Australian Embassy in Mongolia. Interplast's long-term objectives are to improve the quality of life of people living with disability as a result of congenital or acquired medical conditions and to increase their access to local health systems. Interplast also contributes to the development of sustainable health systems and capacity building of health professionals in the Asia Pacific region. August 16 (Jargal DeFacto) President of the Santa Barbara Institute for Consciousness Studies, Dalai Lama's interpreter, Tibetan Buddhism academic. Ulaanbaatar, August 17 (MONTSAME) Chief of Staff of the President's Office P.Tsagaan received Wednesday participants of the annual international summer training for young Mongolists, in the Civil Hall at the President. P.Tsagaan expressed his satisfaction with meeting with young scholars on Mongol studies and thanked them for studying Mongolia. He talked about with them on Mongolian language and culture and wished them success in academic works. This year's training is being attended by some 30 scholars from 18 universities, institutes and scientific centers of 12 countries. The main objectives are to let young scholars get familiar with Mongolian lifestyle and to provide them with an environment for learning Mongolian language and culture. August 15 (gogo.mn) President Ts.Elbegdorj awarded some Mongolists with state prizes, Orders and Medals for their outstanding achievement and contribution to the development of the Mongolian Studies. August 16 (gogo.mn) We deliver you the speech by President of Mongolia Ts.Elbegdorj at the opening of the 11th International Congress of Mongolists. I extend my heartfelt congratulations and best wishes to scholars and researchers who are participating in the grand assembly of the Mongol studies - the 11th International Congress of Mongolists. Last July, Mongolia hosted the 11th ASEM Summit, and this month, the 11th International Congress of Mongolists is being held in Ulaanbaatar. The Olympics of Mongol studies – the 11th International Congress of Mongolists begins coinciding with the Summer Olympic Games in Rio de Janeiro, Brazil, the symbol of solidarity of the peoples of the world. Half a century has passed since the first Congress of Mongolian language was held in Ulaanbaatar in 1959. We are proud of the outstanding scholars and Mongolists who made invaluable contributions to the development of Mongol studies - Academician B.Rinchen, Academician Ts.Damdinsuren, Academician Sh.Luvsanvandan, A.Luvsandendev, B.Shirendev, Sh.Bira, Dr. Charles Bawden of the UK, Dr. Abematsu Genichi and Prof. Shigeo Ozawa of Japan, Dr. P. Alto of Finland, Dr. Garma Sanjeev of Russia and Dr. Raghu Vira of India. Following these scholars, a new generation of Mongolists is emerging, enhancing and further advancing the Mongol studies. Mongolia is an interesting nation of rich ancient history, great tradition of statehood, and amazing historical and cultural heritage. Mongolia is an independent country and the home of all Mongols carrying language, culture and unique mentality. Therefore, we have aspiration to preserve our national uniqueness, while keeping up with the achievements and discoveries of the humanity in the globalization era. Mongolian traditional culture was created in nomadic life and our modern culture was born in sedentary lifestyle. Unique features capture people's interest and attention. Therefore, scholars from many countries have studied and continue studying the Mongolian language and culture. The first native priest of Mongolia will be ordained next week in the world's youngest Church. The Apostolic Prefecture of Ulaanbaatar in Mongolia was established in 2002 after missionary priests arrived in the early nineteen-nineties. It has not yet reached the status of a diocese, as it is still too young to support itself. Joseph Enkh (pictured with his mother) was ordained a deacon on 11 December 2014 in Daejeong, South Korea, where he received his initial formation. He will be ordained a priest by Mgr Wenceslao Padilla, Bishop of Ulaan Baatar, on Sunday 28 August. Fr Anthony Chantry, National Director of Missio, the papal charity responsible for supporting the local Church overseas, said: "We at Missio rejoice with the community in Mongolia, as this is a wonderful example of what it means to be a missionary Church. The first native priest of Mongolia is a great sign of hope for the people of Mongolia and for us all." Missio has recently supported the Mongolian Church through the training of lay leaders and the formation of Deacon Enkh. In their World Mission Sunday collection last year, which focused on Mongolia, the charity raised £533,397 for its work training priests and building churches. In correspondence between Missio and Bishop Padilla, His Excellency described the ordination as a "historic event in the life of the Catholic Church in Mongolia". There are currently just over 1,000 baptised Catholics in the country, with 20 missionaries and 50 nuns working in six parishes. A novena is being prayed in the run-up to the ordination. August 16 (UB Post) To enrich the repository of the National Museum of Mongolia, the Ministry of Education, Culture, Science and Sport has purchased paper money dating back to the Yuan Dynasty from private collector O.Otgonbaatar, and 200 silver coins from the Sasanian Empire from private collector D.Zandaakhuu. The paper money, made from palm tree fiber, is inscribed with the square script (Durvuljin Useg) created by Lama Lodoijaltsan (1235-1280). Some researchers consider the paper notes used during theYuan Dynasty to be the first paper notes ever used. Songinokhairkhan resident O.Otgonbaatar said his mentor Jamsranjav gave the note to him before he passed away. Jamsranjav is believed to have inherited it from his father, Rinchen, who received it from Zava Damdin. Rinchen told his son that a saint from Zavkhan Province gave the paper note to Zava Damdin. Sources suggest that the saint was Diluwa Khutugtu Jamsrangjab (1883–1964), who was a Mongolian noble, a Tibetan Buddhist tulku, politician, and a Mongolian-American scholar. Although the silver coins of the Sasanian Empire were never used in Mongolia according to historical records, D.Zandaakhuu said the 200 silver coins acquired by the museum were found in a leather bag discovered in Arkhangai Province. The Sasanian Empire was the last Iranian empire to rule before the rise of Islam, ruled by and named after the Sasanian Dynasty from 224 to 651 AD. August 16 (Motherboard) Cute cat videos are widely known to be the foundational bedrock and unofficial currency of the internet. It takes an incredibly high rating on the adorability index for one to distinguish itself as a true classic, worthy of enshrinement in the annals of online feline fame. Well, hold onto your butts, because the Siberian Times just posted footage of some manul kittens playing around in Mongolia. Captured by Bariushaa Munkhtsog, a wildlife biologist based at the Mongolian Academy of Sciences, the video is a rare window into the world of this elusive wild cat, also known as the Pallas's cat, which is native to the steppes of central Eurasia. With their puffy coats, stumpy legs, and flattened face, manul kittens look like ready-made Pixar characters. Their ears are short and set widely apart, giving them an almost Ewok-like quality. In contrast to the vertical slit-shaped pupils of most other cats, theirs are round and expressive. Though they only grow to the size of domestic cats, their thick fur coats—the densest in the feline family—beef them up a bit, both in size and in evident cuddliness. All of these adaptations add up to a predator superbly suited to its mountain and grassland habitat. Manul cats can't run very fast on their adorably squat legs, but they are skilled at ambushing small animals such as pikas, gerbils, voles, marmots, partridges, beetles, and grasshoppers that share their high altitude habitat. Indeed, Manul cats are so practiced at patiently watching and waiting for their prey that they can apparently sense when they are, in turn, under surveillance. The below footage beautifully captures the moment a manul cat validates its hunch that a camera trap had been placed in front of its den in Port Lympne Wild Animal Park in Kent, England. The video proves that these cats are not only keen observers of their environment, but that they also have some impressive slapstick comedy chops. Various species have been vaulted into online stardom in recent years, among them sloths, red pandas, and honey badgers. Given that it is essentially an ultra-expressive furball with a penchant for badass surprise attacks, the manul cat is no doubt poised to be next. Kathmandu, August 16 (Himalyan News Service) A 32-member Ruslan Three Star Club squad, including 19 players, on Tuesday left for Mongolia to take part in the Qualifying Play-off of the AFC Cup 2017 to be held at MFF Football Centre in Ulaanbaatar from August 21-25. Three Star are in Group B along with hosts Erchim FC and Nagaworld FC of Cambodia. They will play hosts Erchim on August 21 and face Nagaworld two days later. Bikram Lama is the skipper of the team, while Nirajan Khadka is the vice-captain. Abishek Baral, Ajayi Martins Kayode, Alan Neupane, Asim Jung Karki, Bijay Dhimal, Bijay Gurung, Binaya Shrestha, Bishnu Bahadur Sunar, Bishnu Gurung, Buddha Raj Limbu, Devendra Tamang, Peter Segun, Prakash Budhathoki, Ranjit Dhimal, Roshan Malla, Saroj Dahal and Sunil Bal are other members of the squad. Meghraj KC is the head coach and Rabindra Silakar is the assistant coach of the team. Krishna Awale is the team manager and Suraj Bhusal is the physiotherapist. Club President Arun Man Joshi is also travelling with the team. Meanwhile, coach KC said that the team was traveling to Mongolia with the aim of finishing as the group winners, while skipper Lama said that the team had the best preparation for the competition and would produce winning results. In other pools, Dordoi (Kyrgyzstan) will host Casa Benfica (Macau) and Rovers FC (Guam) in Group A, while FC Tertons (Bhutan) are in Group C along with Sheikh Russel Krira Chakra Ltd (Bangladesh) and Tatung FC (Chinese Taipei). The three group winners will qualify for the play-off round, which will serve as the qualifiers for the finals of the competition. Ulaanbaatar, August 17 (MONTSAME) Our judoka L.Otgonbaatar IMS has undergone surgery on his shoulder due to an injury, in a hospital of Rio de Janeiro. He got injured when fought at the bronze medal match in the men's -90 kg judo against his Chinese opponent. According to a medical diagnosis, Otgonbaatar's left shoulder sinew cut, and the surgical operation lasted for about three hours to connect the sinew on Tuesday. After the surgery, Otgonbaatar's health condition has improved, therefore he moved to a recovery chamber. August 17 (news.mn) Mongolian boxer E.Tsendbaatar in the men's 56 kg category was defeated by Shakur Stevenson of the United States on 16th of August. He was the last member of the Mongolian Olympic team participating in the boxing category. Mongolia entered six boxers to compete in each of various weight classes in the Olympic boxing tournament. The International Master of Sport D.Otgondalai in the men's 60 kg category won a bronze medal. After 11 days, Mongolia currently ranks 55th in the world in terms of medals. Mongolian judoka D.Sumya won an Olympic silver and boxer B.Otgondalai took bronze. August 15 (UB Post) The youngest athlete of the Mongolian Olympic team, 16-year-old B.Yesui competed in the women's 50-meter freestyle, and set a new state record. She came to the finish line within 28.40 seconds at the Olympics. The previous state record in the women's 50-meter freestyle was 29.51 seconds, which was set by B.Yesui herself. A total of 88 swimmers competed in the category, and B.Yesui came in 60th place. The following is a brief interview with B.Yesui after the competition. Congratulations on setting a new state record. I am competing in the Olympic Games for the first time. I am very happy that Iset a new state record while competing against the world's top athletes. I trained for the Olympics in the USA for a month. That was really helpful, I think. Did your father come to Brazil to support you? Yes, my father is here. He watched the competition. I want to express my gratitude to everyone who supported me. I am very happy that I competed in the Olympic Games for Mongolia. August 15 (news.mn) Mongolian judoka are continuing to make their country proud at Rio 2016. Meanwhile, Mr. Bukhbat Mashbat, the General Secretary Mongolian Judo Association, has become the country's first referee at the Olympic Games. having received the participation certificate from International Olympic Committee. He is working on the judges' panels for the Olympic judo competition. Two other Mongolians have been included on the judges' panels for the boxing and freestyle wrestling events. So far, 13 Mongolian judokas are qualified for the Rio Olympics. This means that Mongolian currently ranks fourth in the world in judo following Japan, Brazil and France. August 16 (news.mn) After 10 days, the USA is leading the Rio-2016 Olympic medals count, with 26 gold, 22 silver and 24 bronze, followed by UK (38), China(45) and Russia(30). Mongolia with two (silver, bronze), currently ranks 55th in the world in terms of medals. Mongolian judoka D.Sumya won Olympic silver and boxer B.Otgondalai took bronze. Today (16th August), E.Tsendbaatar in the men's 56 kg category will fight Shakur Stevenson of United States. He is the last member of the Mongolian Olympic team participating in the boxing category. For the five other boxers, their competition is over. The Olympic freestyle wrestling competition will start tomorrow (17th August); Mongolian freestyle wrestler P.Orkhon (women's 58 kg) and O.Nasanburmaa (women's 69 kg) will compete. August 16 (news.mn) Under the auspices of the President, the 'National Cup-2016' football competition took place in Baruun-urt in Sukhbaatar province from 8th to 14th of August. For the first time, this competition took place somewhere other than UB. The team from Dornod Province won 'National Cup' twice. On this occasion, the prize money is MNT 30 million. Overall, teams from 15 provinces' competed in the Mongolian 'National Cup'. Orkhon won silver and Uvs bronze. Last year, the team from Selenge Province won the 'National Cup' along with MNT 16 million in prize money. August 17 (CBS News) Heidi Telstad, a Langley lawyer, was recovering from a broken rib and punctured lung after her horse stepped on her. Bored, Telstad wanted to do something "extreme". The 43-year-old found the Mongol Derby — a grueling 1,000 kilometer endurance horse race across Mongolia using semi-wild horses. "The adrenaline rush somehow makes you extremely brave or stupid," she laughed. "It definitely feels good!" Telstad spoke to The Early Edition from Ulaanbaatar, Mongolia about riding in the race. "Just before I started the race, I was really nervous, and my confidence was really shot," she said. "But once I got on the horses, it was exciting. I think I was the happiest I had ever been. I think my jaw was hurting from smiling so much." Riders in the endurance race — the longest horse race in the world — use multiple semi-wild horses to travel across Mongolia's steppes, mountain passesand desert landscapes. "They're just semi-wild, you can barely handle them, catch them, put a saddle on them. A couple of horses — it would take three herders to hold it down just to put it down to put a saddle on." Telstad said she was very lucky that she didn't get injured, adding that up to 17 riders dropped out of the race due to severe injuries. However, Telstad did not just complete the race, but crossed the finish line in first place with two other co-winners: Will Comiskey, 28, 'Dingo', a cattle rancher from Australia, and Marcia Hefker-Miles, 45, from New Mexico. "To be able to cross the finish line with these two amazing people, I couldn't have asked for anything more. I don't think the win would have been as sweet by myself." Telstad also used the race as an opportunity to fundraise for the B.C. Epilepsy Society, and she said she has raised $2,800 so far. "It was an amazing ride, that's for sure." August 15 (news.mn) Special tickets for a concert of Russian pop rock band Zveri will be available again for three days from today (15th August). The price for a double tickets price is MNT 20,000. A total of 2000 people can watch the Zveri concert in a special fan zone. The special tickets were to go to the first 2000 people. Price of these seats are MNT200,000. The organizers say, it will be brand new stage. A total of 500 lights and 200 speakers have been installed at the stage. The event has been scheduled for 2nd September at the National Stadium in Ulaanbaatar. The concert aims to promote international efforts for saving the Mazaalai (Gobi Bear) under slogan "Sing for Mazaalai". Zveri was formed in 2011 by Roman Bilyk, the lead singer of the band, better known as Roma Zveri. The band was named after his nickname. Zveri's song "Kvartira" (apartment) is featured in the Grand Theft Auto IV video game. August 16 (gogo.mn) City Mayor S.Batbold received Mongolian Honorary Consul in Norway Mr. Kjetil Krane and exchanged views on further cooperation between the two countries. Honorary Consul Mr. Kjetil Krane stated "Within the framework of celebrating the 50th anniversary of establishment of diplomatic relations between Mongolia and Norway in 2018, Norwegian famous painter Edward Munch`s exhibition have planned to be opened in Ulaanbaatar. We would like to work together on this matter. Currently, we are cooperating with the Ministry of Foreign Affairs and Ministry of Education". Moreover, he expressed his interest to organize dinosaur exhibit in Oslo city. Mayor S.Batbold made in response to the request and noted "First of all, I would like to express my willingness to open exhibition of Norwegian famous painter Edward Munch in Ulaanbaatar city. We will establish a working group in order to show all kinds of support. In scope of 50th anniversary of establishment of diplomatic relations, we are willing to organize Ulaanbaatar cultural days in Oslo city, exchange experiences on urban planning, road, transportation and logistics industries, train specialists​ as well as cooperate to develop winter tourism. August 16 (Los Angeles Times) The Netflix original series "Marco Polo" is more than a reinterpretation of the Venetian merchant's travels through Asia during the 13th century — it's a look back at the dress found along the silk road during that era. The historical drama features a large collection of ornate bespoke costumes, all handmade by a team of freelance artisans under the watch of costume designer Jo Korer. WWD caught up with Korer to discuss the show after the release of its second season last month. WWD: How did you alter your approach between season one and season two? Jo Korer: Season one was very much typical of a new show — everybody was finding their feet. We kind of stuck to more the historically correct look and that — to be honest — Mongolians wore robes. If it's summer, it's cotton robes, if it's winter, it's wool robes with fur and leather. I started to make noises around about halfway through filming season one that I felt [the look] should evolve. I felt, what was starting to happen was it was very obvious Marco Polo's time with Kublai Khan was extending and developing…I felt a lot of the characters needed to move on. The biggest task for me was to keep [the costumes] fundamentally historically accurate, and not take it too far into the contemporary realm, but definitely stylize them more. WWD: What kind of research went into making the show historically accurate? Korer: For season one I was flown to Mongolia, and I worked with a historian. Of course, there was no photographic evidence of that time. It was very much down to the museums, the books — of which there are very few — and even less in English. It was very helpful to have at least a few books that had been written by historians in Mongolia. Also the museums and the paintings there. It was very important to me to actually spend time in Mongolia and get a feeling of not only the clothes and what they would look like, but the wearability and access of certain fabrics or furs that would be around at the time. I tried to stick as much as I could to being historically correct. Any decoration I used on any of the costumes, whether it be for the jewelry or stones that were woven into or appliqued on the costumes, or with the dyes and the color we used, I tried to be sensitive and aware of what plants or what minerals were available in any of the particular areas we were trying to depict. It was greatly helped of course with the connection of the silk road, that connection from Mongolia straight through to Europe. WWD: Where did you source the fabrics and beading used for the costumes? Korer: Literally around the world. London, Venice, Rome, Florence, Istanbul, China, Mongolia, India, Thailand, Bangkok, Shanghai, some fabrics in Malaysia itself — worldwide. And I went to all of those countries to personally find them and purchase them. And same for all of the accessories, all of the gem stones. You have to, with a show like this, to find the authenticity you need. You have to travel, and you need to go to markets. A lot of the items I bought were antique from markets around the world. I found contemporary sources too contemporary. To define the more traditional antique feel to [the show], that's what takes the time, to source that beautiful antique feel. WWD: How long did it take to make each costume by hand? Korer: When we're making the more intricate designs of like Marco Polo's jacket, they're all hand-beaded with crystals and stones. It takes a long time, sometimes two to three weeks with three or four people working on it. What takes the time is actually the first [costume]. Once we've made one, we usually have to make another twp, sometimes even three — for the stunts people to wear or the actor to have a double. How large is the show's costume department? Korer: There's somewhere around 22,000 individual pieces between season one and two — that's all of the actors, all of the crowd, everybody. It's mammoth. The costume department is quite huge. I have more than 200 people in the costume department. All of the armor is handmade, all of the metalwork, everything is handmade. It's a very large department that works incredibly hard and supports me 100 percent. I wouldn't be anything without them. NASHVILLE, TN, August 16 (Fox 17) - Almost $1 million U.S. tax dollars funding art in Mongolia. Those "art" pieces range from plastic bags filled with air to animal bones and blank CDs. All for sale on our dime. Since 2010, the U.S. State Department gives grants to the American Arts Incubator program, which is funding this project in Mongolia. The art is sold in a project called "Everything for Sale, Art for Sale." The plastic bags, blank CDs and animal bones are among the things artists walk through the black market in the capital city offering for people to buy. The U.S. State Department says the purpose of this art through the American Arts Incubator program is to engage the community as a way to advance U.S. foreign policy, addressing a local community issue. The issue in Mongolia: Pollution and its impact. A chart on usaspending.gov shows five government grants given to this program since 2010. The most recent three since 2013, totaling more than $800,000. The U.S. State Department has announced on its website that American artists yet to be chosen will travel to Cambodia, Colombia, Guatemala, Russia and Thailand in 2017 through the American Arts Incubator program.